This newer edition of The Hobbit offers an introduction written by Christopher Tolkien, recent text corrections, and the inclusion of all of Tolkien’s original drawings and illustrations in color, as well as enhanced maps. This is a wonderfully exciting adventure for those of all ages. Tolkien wrote this story for his own children and tween and young adults will enjoy The Hobbit as it introduces the reader to the world of the Hobbits, Middle-earth, Biblo Baggins, Gandalf the wizard, and the Ring of power. Bilbo’s home is visited by Gandalf the wizard and thirteen dwarves, inviting Bilbo to be the burglar of the group of adventurers; one side of Bilbo’s family, the Tooks, were adventurers, so he has it in his blood, if not in his initial desire to not go. While on the journey, the band first runs into a group of Trolls, who want to eat the entire party. After that escape, they meet Elrond and the elves, who invite the group to stay a while, to eat and rest up for the next part of their travels. After leaving the elves, sometime later, they take shelter in a cave, and are discovered and captured by the goblins. It is during this time of the story that Bilbo, who had escaped capture, finds the Ring of Invisibility. When he would slip it on to his finger, he would become invisible to those that looked where he was. Using the ring to hide himself, he meets Gollum, deep within the bowels of the goblin kingdom. Gollum challenges Bilbo to solving riddles; the one who loses grants the other’s wish. Gollum only wanted his “Precious” back, the ring. Bilbo, meanwhile, wanted to find an escape route for him and the dwarves, who were being held captive by the elves. Bilbo outsmarts Gollum and escapes with his life. After escaping the goblins, the troop comes against the Wargs, wolves that were associated with the goblins. The band of adventurers is saved by a group of very large Eagles, which swoop down and save Bilbo and gang from the wolves. This puts the travelers near their goal, the Lonely Mountain, home of Smaug, the dragon. Using a map that Gandalf gave the group, they find a hidden back entrance to the mountain. Bilbo enters and encounters Smaug sleeping, and Bilbo weakens a spot on the dragon’s armor. Eventually when Smaug leaves the cave to seek out the adventures on the outside of the mountain he killed by an arrow shot by Bard through the spot Biblo weakened. As a war is brewing between the dwarves and the humans who want a share of the gold that Thorin refuses, through some burglary and negotiation, Biblo unites the parties, and differences still not yet settled, the humans, dwarves, and elves band together to fight the horde of goblins and Wargs in which Beorn comes to their aid with the eagles which ensures their defeat. When Gandalf rejoins the party, he helps settle things, and peace ensues. As the story concludes, Biblo, along with his portion of the find, journeys back to the house under The Hill, to spend his treasure and life as he wants. There are many characters in this fantasy tale of Middle Earth (although not called Middle Earth in any of this tale, but clearly so in the later books that follow by J.R.R. Tolkien). Bilbo Baggins, a Hobbit who lives under The Hill; the main hero of the story, Bilbo journeys to the Lonely Mountain with his group of adventurers, in search of treasure and more. Hobbits are smallish/short creatures, not much to venture away from home, with hairy toes and big appetites. Hired on to be the burglar of the group, a task very much unlike Bilbo (or so it seems at the time). He shows insight, bravery, and wisdom during the tale, while being described as a timid creature in the beginning of the tale. Gandalf the Wizard, is a white, or good, wizard of the realm. It is Gandalf that comes to Bilbo to invite him to be the burglar of this fine troop of adventurers. The band of dwarves led by Thorin, heir to the realm Under the Mountain, is a fierce leader. All of the dwarves are short in stature, but long in the beard. The rest of the group was: Dawlin, Balin, Kili, Fili, Dori, Nori, Ori, Oin, Gloin, Bifur, Bofur, and Bombur. Each dwarf exhibits their own individuality in their actions, although Kili and Fili, the youngest of the dwarves, are spoken of as if they were one, with similar actions throughout the tale. The good vs. evil characters/creatures are many in The Hobbit. Evil beings of the story include trolls, spiders, goblins, Wargs, bats, and other frightening creatures. Each group has their own characteristics, the trolls being slow and very large; the spiders, playing on people’s fears of spiders and having them large enough to overcome a dwarf and capture them for food, the Wargs being wolves, another animal that men fear, while the goblins are described as fearsome and dark beings, the epitome of evil. As the good characters go, most were represented in the book more as individuals, such as Beorn, the man who could transform into a bear, to Elrond and the Elves, to Bard and the humans of the Dale, the lands below the Lonely Mountain, as leaders of their groups. It appears in the story that the good has leaders that stand out individually, while the bad or evil creatures are seen more as a pack or group. The only exceptions to this are the eagles. A magnificent creature in real life, the eagles are very large birds, large enough to pick up a dwarf or hobbit to rescue them, or fight off the goblins during the war at the end. Smaug, the dragon, is an evil creature that is described on its own, primarily because he is one of the last dragons still alive. He is the hoarder of mounds and mounds of gold and silver, which he obtained while wiping out villages and people/dwarves, stealing their gold and hoarding it in his cave on the Lonely Mountain. It is Smaug that has killed the dwarves that formerly resided in the Mountain, and is now trying to kill the party of fourteen, who want to lay claim to the riches that Smaug has and return the mountain to the dwarves. And, Gollum, because of his prominence in The Lord of the Rings trilogy, is a vital part of that story, but in The Hobbit, his part is one of many antagonists in the story. The ring is only seen as a good thing in this story, but his bad side later comes out in the Lord of the Rings trilogy, which follows his tale. 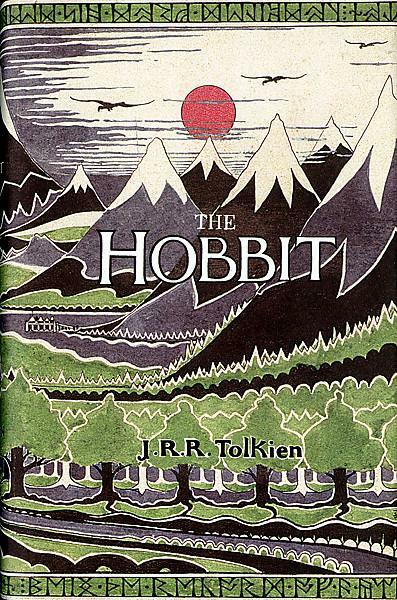 In this book, Gollum is the keeper of the way out of the goblin’s lair, and will only assist Bilbo if the hobbit can stump Gollum with a riddle. The Hobbit, like most fantasy stories, is a tale of good and evil, and the author, near the end of the story, shows how strong individuals can fall victim of corruption when monetary possessions/value are at stake. How the pure of heart, Biblo, and his dominating good can be a positive influence on others in their party. J.R.R. Tolkien within in his writing, beyond storytelling, his voice and opinion is at times apparent and very much welcomed. Those who have already read the Lord of the Rings trilogy will eagerly want to read the backstory found in The Hobbit in the greatest fantasy-adventure book of all time. And for those who have yet to read The Lord of the Rings trilogy (The Fellowship of the Ring, The Two Towers, The Return of the King), and want to know all the hype behind the phrase“One Right to rule them, One Ring to find them, One Ring to bring them all and in the darkness bind them”, shouldn’t hesitate getting a copy of the J.R.R. Tolkien’s’ novels. Tolkien fans may also enjoy the work of Christopher Paolini’s Inheritance Cycle (Eragon, Eldest, Brisingr, Inheritance) with many similar fantasy characters yet still a fresh new story. The Hobbit is scheduled for a three part movie release beginning with The Hobbit: An Unexpected Journey in theaters December 14, 2012.